The hammock arrived on time and is appears to be of good quality. I purchased this hammock for my husband because he has been talking about putting a hammock in our back yard forever. We have 2 trees that are perfectly spaced for this and he loves the idea of spending a lazy afternoon napping in a hammock. I was very impressed with this product. I have to admit that I was skeptical as to the quality since the price was so good. It is very well made and is quite substantial. It is definitely not cheaply made. I love the quilting and the fact that this has wooden stretcher bars. I have had the hammocks without stretcher bars in the past and I hate the cocoon effect that I¡¯m left with. 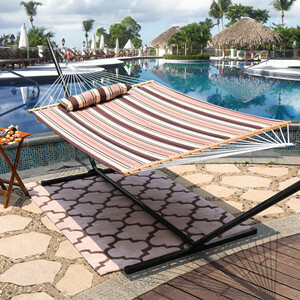 This hammock stays flat and really allows you to stretch out and be comfortable. Also love that a head pillow is included. My husband loves this- just what he¡¯s been dreaming of! 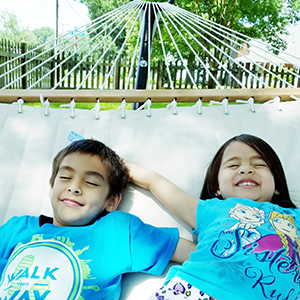 This hammock has me dreaming of summer! It is such a great price so I snatched it up but it is hard waiting for nice weather! I took it outside during a break from the rain to try it out and it is so comfortable! The pillow is a cute touch and when it started raining again I noticed the fabric is water resistant! I am really looking forward to using this more as the weather gets nicer! Nice cream color. I love it. Its big enough for two people to relax and well made. 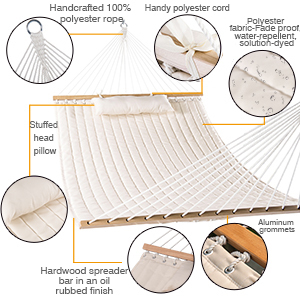 Most importantly, it has a water resistance to it which is a huge upgrade from my last hammock which grew mold from moisture and eventually the fabric weathered and rotted as well. It also helps keep it cleaner. I think this one will last quite a bit longer than my last and is reasonably priced compared to alot of other double wide hammocks out there on the market. 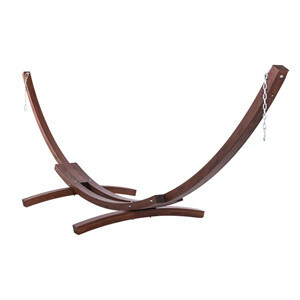 Seems very sturdy and looks very good. Much slipperier than the previous hammock (rope) so be forewarned getting in and out! Was shipped quickly and arrived before expected. Materials are superb, and very pretty too. Strong and beautiful, my husband over it and was happy I surprised him with it. I cannot give a first hand review until I get my wife out of the thing. Looks good, construction looks sturdy. Will not be tested until spring. Color is much better in person.